What is Battle Royale Video Game? Battle Royale is a video game genre that is a hybrid of survival exploration and scavenging elements. In this genre, a large number of players usually 100) are fighting against each other on a large isolated land where only one player gets to be victorious. Some battle royale games support different play modes, which allow players to play in squads, usually between 2 to 4 teammates in each group. In group matches, other players fight other squads, although they can also, in some BR games, fight against individuals who haven't chosen to fill in the place of missing squad members. Battle Royale is played in either first-person or third-person perspective. Players are dropped into the island with minimal equipment. This usually means not having any weapon at all to start with, not any armor or gear. It's up to the player to scavenge the environment, locate equipment and weapons and use it for his survival. When the game starts, all players are dropped from an airborne vehicle that travels high above the ground. Players can drop off at any point while the vehicle is over the island. Furthermore, at the start of the game, all areas on the map are safe, which means you are in a safe zone. As the game progress, that safe zone (usually a circle, custom ones like in Island of the Nyne) is shrinking and relocated into a random area within its current area. This means that a safe zone cannot be located in an area that was previously not inside the safe zone. If players are caught within the unsafe zone (e.g. storm in Fortnite), they take damage over time (DoT). If a player's health is depleted, he or she either knocked down or eliminated from the game. Being knocked down means that a player can still be revived by his teammates, but in that state, the player's mobility is significantly affected and handling a weapon isn't available. The only option you have is to find a safe place to hide or wait for a teammate to revive you. When you are revived, you gain a partial health. The goal of a battle royale game is to be the one last standing, either alone if you play solo or win as a group if you play in duos or in a squad for example. If you play in a squad, you can become victorious even if you are eliminated during the game, as long as one of your teammate or teammates survive until the very end. A gradually shrinking safe zone requires constant relocation, also referred to as rotation. Maps in battle royale usually feature many buildings, vegetation, elevated terrain and structures, which promote strategic gameplay and careful planning. Because the safe zone and the map itself is very large at the beginning of the game, it's very common finding players scavenging for long distance weapons, like a hunting rifle or sniper rifle that allows you to eliminate players way far from where you are positioned. Of course, there are many mid-range weapons like assault rifles, close-range weapons like shotguns and even melee weapons like swords, axes, clubs, etc, depends on the game. Some games have explosive weapons like C4 and grenades. Other games like Fortnite Battle Royale employ a building mechanic, allowing players to build structures using materials like wood, stone, and metal that they scavenge from the environment. Speaking of loot, when you eliminate a player in a battle royale, you get the option to loot all the stuff that player was carrying, including any armor, materials, weapons, items, explosives, health kits, etc. In many battle royale games, players have two health bars, one is the actual health of your character, the second one is a shield which protects you from explosive and projectile damage, in most cases. You can charge each one fully individually, but to do so, you'll need health kits or shield kits which are scattered around the environment. It's important to note that there are no respawns in a battle royale game. Maybe some BR in the future might introduce some type of respawning mechanic, but in most cases, this isn't an option. If you are eliminated you are out of the game. You can spectate the player that eliminated you or one of your teammate that is currently alive and fighting for your team. Another option is just to leave the game and start a new one over. Battle Royale is a very unforgiving game, if you make a mistake, you are likely to die. In most battle royale games there are many open spaces which makes you vulnerable to sniper shots or ambushes. Even top players are eliminated due to taking high risks, like detaching from the group and trying to go solo for a certain amount of time. In battle royale games you have an RNG element. The type of items and their location is placed in random on the map, although there are usually some places which loot is expected to be located. Players try to farm an area as much as possible, to increase the chance of finding high-tire gear, weapons, and items and reduce the RNG effect which in some cases can negatively affect their chance of having an advantage over their opponents. Battle Royale has its root before 2012 with gameplay modes featuring last man standing. Shortly after the release of the film The Hunger Games in 2012, a server add-on called Hunger Games was developed for Minecraft and in that mode, players were scavenging the environment spread out on the map and fight for being the last surviving player. A game like DayZ which was a mod for ARMA 2 was PvP focused but the engagements in this game were infrequent due to the large size of the game. This led to game modes that created an option for more frequent engagement between players. The first real substantial move was made when Brendan Greene, known as "PlayerUnkown", released a Battle Royale mode for ARMA2/DayZ in 2013. According to Greene, this mode was inspired by the Japanese film Battle Royale from 2000 (Directed by Kinji Fukasaku), and this is why that mode titled "Battle Royale" and rest is history. Later on, Brendan Greene helped adapt this format when he worked as a consultant for H1Z1: King of the Kill before he became a creative developer at Bluehole and envisioned the battle royale game that we all know today, PlayUnknown's Battlegrounds. PlayerUnknown's Battlegrounds (PUBG for short) turned out as a big success. Released in early access in March 2017, the game sold over 20 million units by the end of 2017 and on September 2017, its developer broke a Steam record with over 1.3M concurrent players. That success leads to many developers jumping into the battle royale scene. One of the biggest success stories is Fortnite: Battle Royale by Epic Games. What first started as a co-op zombie-inspired survival game with building mechanics, joined a new free-to-play cross-platform Battle Royale game. As for today, Fortnite BR remains the most popular battle royale game on the planet with a staggering 125 million players as of June 2018 (according to statista.com). It's important to keep in mind that Fortnite, unlike some other games, is a free-to-play game and available for all major platforms, including Android, PlayStation 3, Nintendo Switch, Xbox One, iOS, Microsoft Windows, and Macintosh operating systems. Fortnite: Battle Royale is a very popular game among streamers, which one of the most popular ones is Tyler "Ninja" Belvins who became the world's most popular streamer and is a big part of that Fortnite phenomenon. His skilled "acrobatic" and creative plays in Fortnite, alongside teaming up with Drake, a popular singer, made people enjoy his stream and further helped push Fortnite popularity forward. 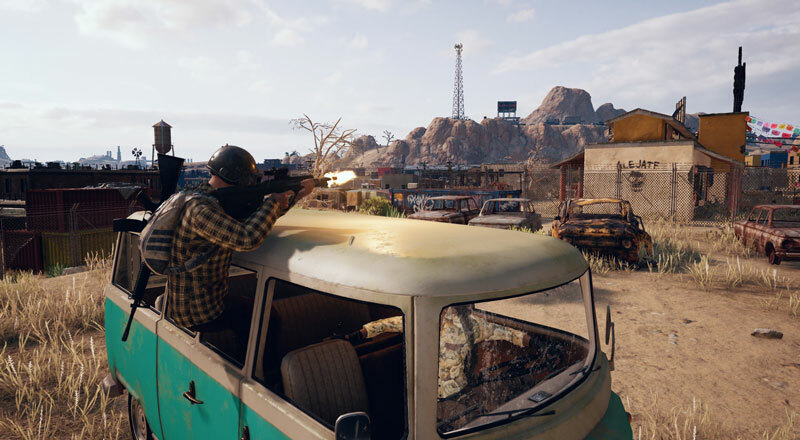 This huge success of both PUBG and Fortnite didn't go unnoticed and many triple-A publishers who already have their footprint in the FPS genre have introduced their own upcoming Battle Royale games. This included Electronic Arts (Battlefield series), Activision (Call of Duty series), Ubisoft and others. Activision dubbed its battle royale game as "Blackout" and EA mentioned a battle royale mode in its upcoming Battlefield V game that is due to release later in 2018. Battle Royale also put strong roots into the eSport market as the game is relatively slow pace and easy to follow, but it packs lots of tension and action and therefore very fun to watch. Here are some of the available battle royale games: PlayerUnknown's Battlegrounds, Fortnite Battle Royale, H1Z1, Darwin Project, Realm Royale, Rules of Survival, Islands of Nyne, The Culling, Fear the Wolves, Knives Out, Blackout, Battlefield V Battle Royale, Cuisine Royale, Radical Heights, Maelstrom, Surviv.io, SOS, Stand Out: Battle Royale VR, Survival Games: Battle Royale, Rapture Rejects, Fractured Lands, Egress, Dying Light: Bad Blood, Battlerite Royale, Europe, Pavlov VR, Mavericks: Proving Grounds and there are many others to come.